We are starting to see the real "primizie" (first fruits) of the summer season here! I say "real primizie", because greenhouse strawberries and tomatoes and apricots, peaches and plums from South America have been on the supermarket shelves for a couple of weeks now. Actually, this is a fairly new practice in Italy. Up until a few years ago most of the fresh fruit and vegetables were grown in Italy and so they followed the seasons. 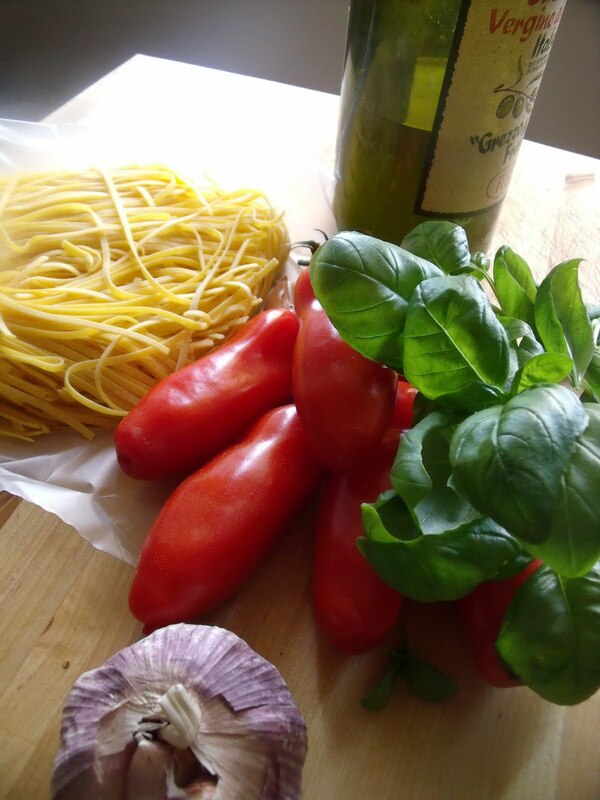 But before I get off on that tangent... my local Pizzicheria had fresh San Marzano tomatoes and fresh basil this morning - so I bought some of each, as well as fresh tagliolini and now I want to show you just how easy it is to make "real" homemade fresh tomato sauce. So, here we go! 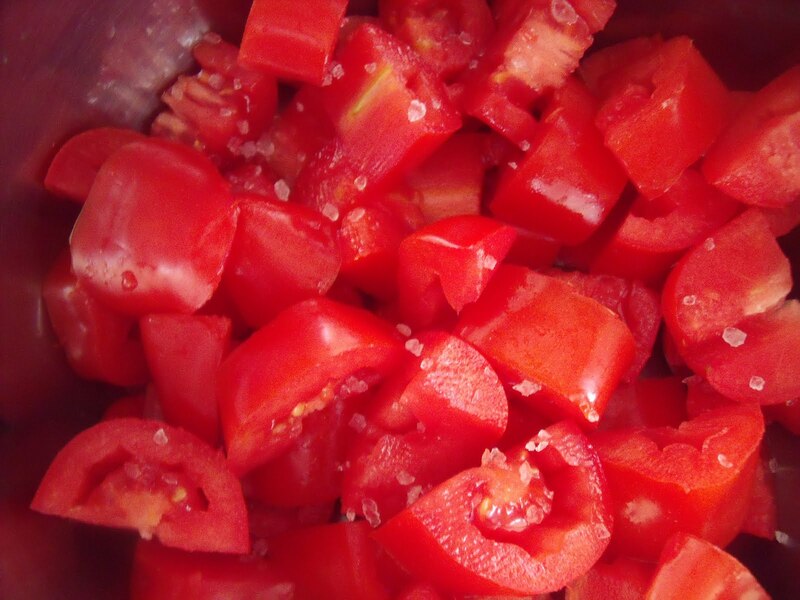 The advantage to this type of tomato as opposed to Jersey or salad type tomatoes is that they are firm, flesh and have little juice. 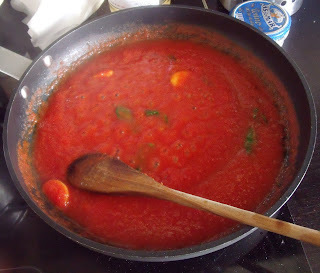 This is important for a thick, rich sauce. This recipe requires a good old-fashioned food mill! If you don't have one, ask your mom or aunt or grandmother to lend you hers! 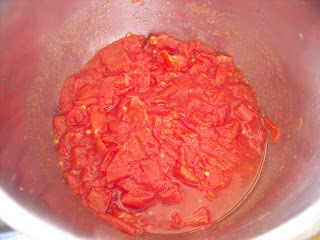 Wash and cut the tomatoes into chunks, place in a stainless steel or other non-aluminium saucepan and sprinkle with about a 1/2 teaspoon of salt. I use coarse salt but regular table salt will do. The salt helps the tomatoes to release their juice. Cook over medium high heat, stirring constantly for about 5 minutes until the mixture is nice and juicy, then lower to medium low, cover and allow to cook for 5 more minutes. You should obtain something that looks like this. 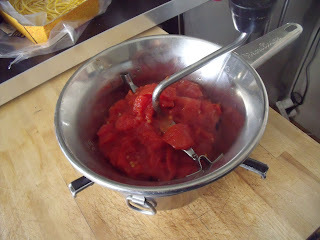 Put the food mill over a stainless steel, glass or ceramic bowl; put the cooked tomatoes into the mill and mill them. 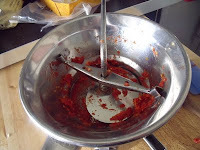 This separates the cooked tomato pulp from the skin and seeds. If you don't have a food mill, you can poach the whole tomatoes for a few minutes, remove the skin, cook for another 5 to 10 minutes and then blend the cooked tomatoes. and this is what you should have in the bowl. 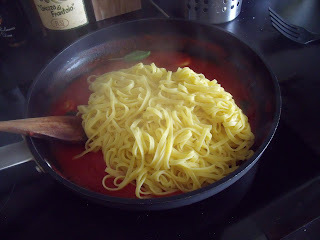 Now put a large pot of water on to boil for the pasta. Put a couple or three tablespoons of extra virgin olive oil in a large fry pan. 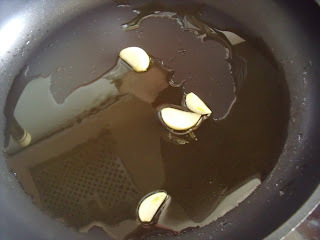 Lightly sauté the split garlic cloves. Don't let them brown or burn as this will make the sauce bitter! 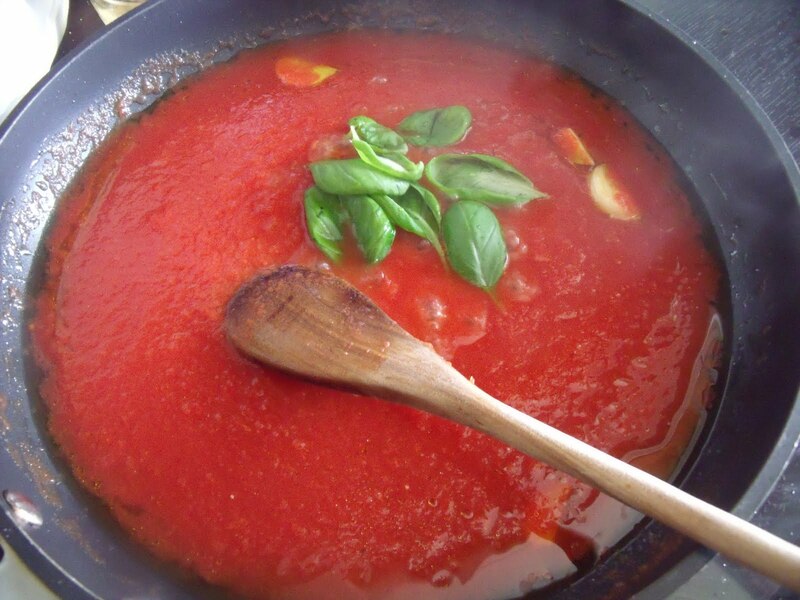 Add the cooked tomatoes and the leaves from a couple of sprigs of fresh basil to the pan. 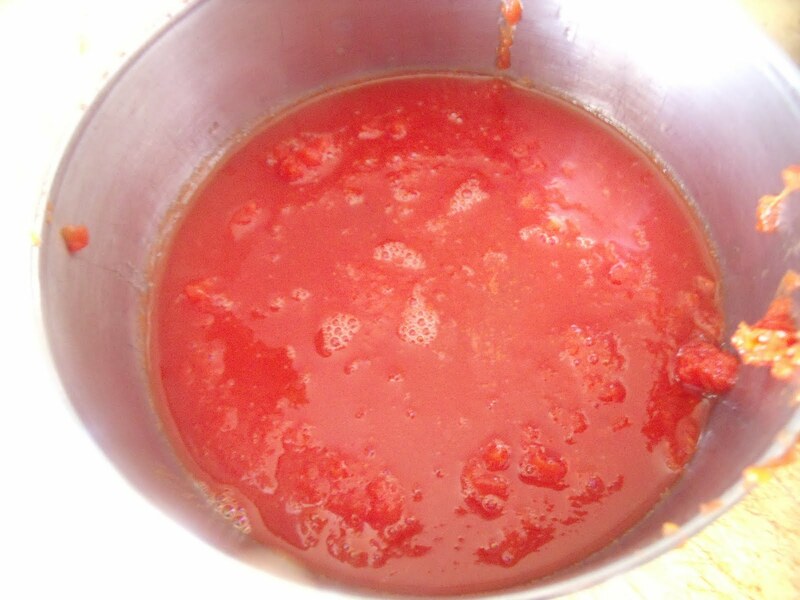 Cook the sauce over medium high heat for about 10 minutes, stirring often. It should really bubble and boil so some of the water evaporates. Cooking it more will "kill" the delicious fresh tomato flavour! By now the water is boiling, so salt it and cook the pasta following the instructions on the package if you use bought pasta. 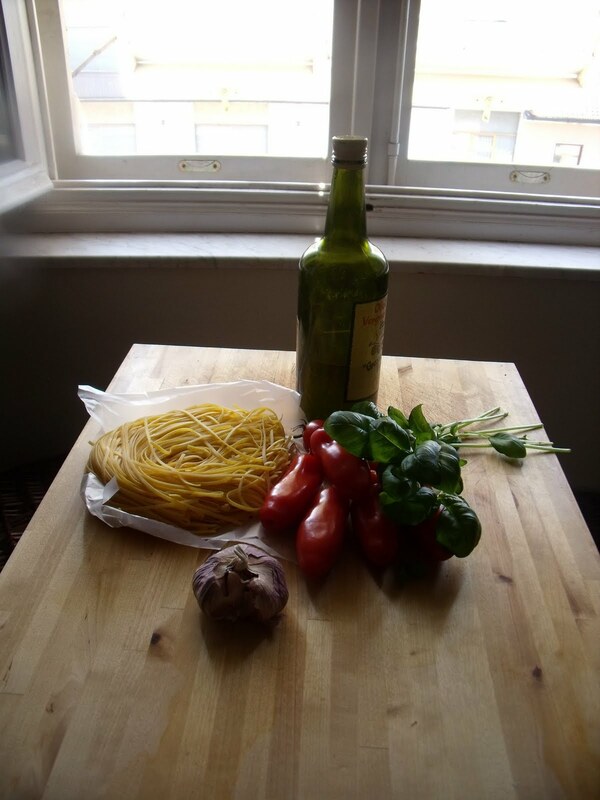 If you are really good and you made your own pasta, cook it for a minute or two. 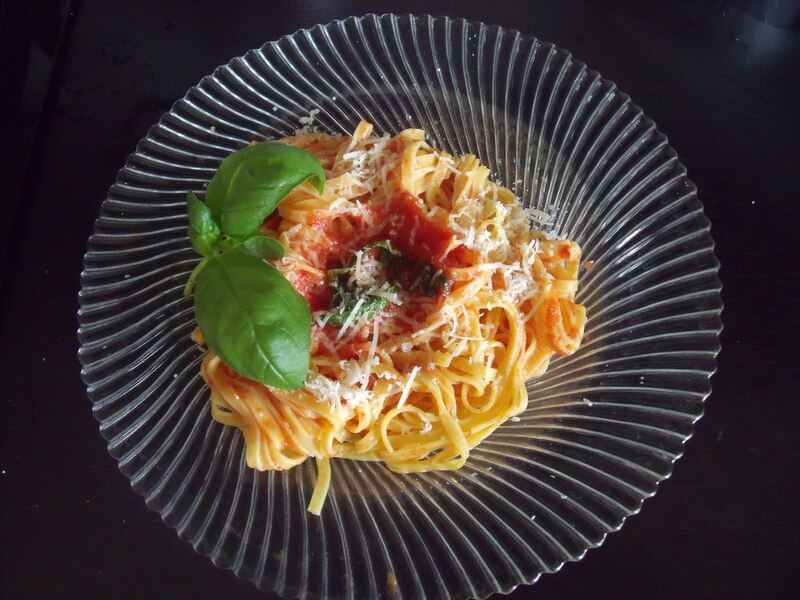 Those tomatoes look just great, I wished my local Pizzicheria (Delicatessen) had them, ever ! 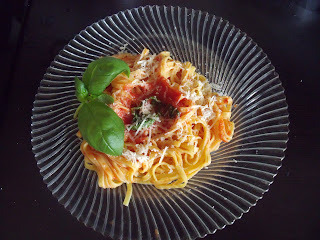 The best I can do here is canned San Marzano .